Its alluring cover beckoned from the Museum of Fine Arts gift shop. Doesn’t that salad look delicious? Don’t you love that raised font? Its magnetic force called, and I couldn’t resist. Tempted to brush the pistachio crumbs from its cover, Pomegranates and Pine Nuts by Bethany Khedry was not to be left behind. For a week or so, it graced my bedside table, feeding sweet dreams spiced with Morroccan, Lebanese and Persian culture. Bethany Khedry is a multicultural soul who tells us the story and experiences that led to this collection of recipes crossing traditions and cultures. A cook book that caters to vegetarian and omnivore tendencies, the medley includes meze (also known as starters, antipasti or tapas), salads, meats and seafood. There’s also a tantalizing list of desserts and drinks. For those unfamiliar with the cuisine, the book introduces key ingredients of the North African and Middle Eastern pantry, and includes recipes for basic dishes. Thanks to this section, I open a pomegranate in a completely different way! With its fabulous food styling and photography, I considered jumping out of bed and to start cooking. A large, ripe pomegranate wandered into my house this week, so it was time to test a few recipes. I made the pomegranate and cucumber salad, mujadarah and white cabbage salad on a grey Sunday afternoon. The salads reminded me of a leisurely meal our family enjoyed on a terrace overlooking the Chouf mountains in Lebanon. Mujadarah is a lentil salad with allspice and carmelised onions. All were delicious and appreciated by everyone at the table (a rare family feat, especially with guests in the house!). Except for the pomegranate, the ingredients were items you could find at almost every grocery store. If you live near a Whole Foods, everything would be easily available (even dried chili peppers for harissa). Never fear, Pomegranates and Pine Nuts includes an appendix of online suppliers makes the recipes accessible to those far from urban areas. At this point, I hit the web, wondering who else enjoyed this culinary voyage across the Middle East. 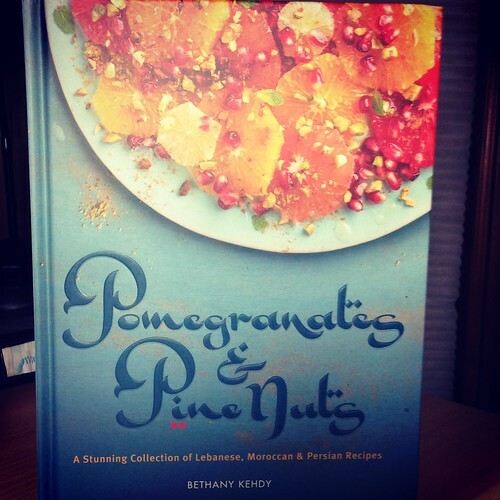 Pomegranates and Pine Nuts is the American title of the book, which is available world wide as The Bejewelled Kitchen. Turns out there’s even a video where Bethany talks about the book. I’m looking forward to trying more recipes from Pomegranates and Pine Nuts. Any of you found this cook book just as sunny and irresistible? I’d love to hear what you try.